Yacht Solar the Arcadia 85 motor yacht is the first yacht to come out of this Italian based innovative yacht building company. There are another two yachts, that are currently at the stage of a concept and have not started the construction yet. These are the Arcadia 115' and Arcadia 135. 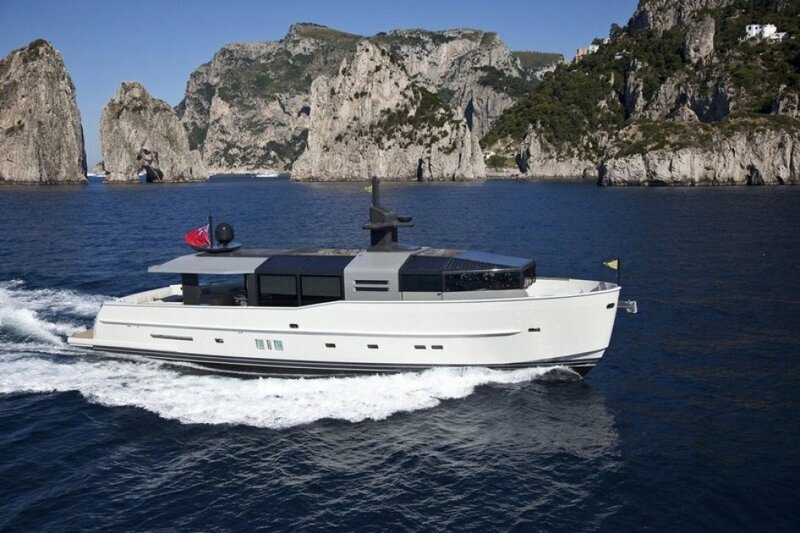 Motor yacht Arcadia 85 Solar was first presented to the public at the Boot Dusseldorf yacht show, earlier this year. 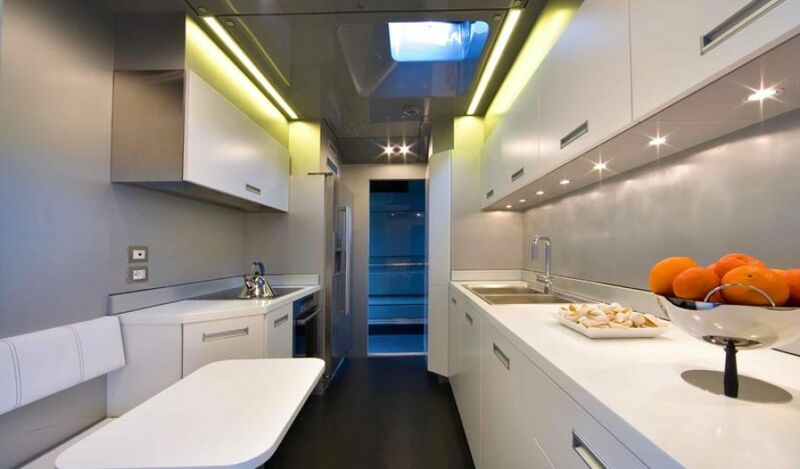 The design of this yacht reflects simple and understated styling. Her deckhouse has been made almost entirely out of double layered reflecting glass, giving the interior a bright and airy feel. The sliding over-head panels can provide privacy and shade, as required by the owner and his guests. The hull shape of the Arcadia 85 motor yacht Solar is such, that it requires low power engines, while the solar panels are used to recharge batteries. 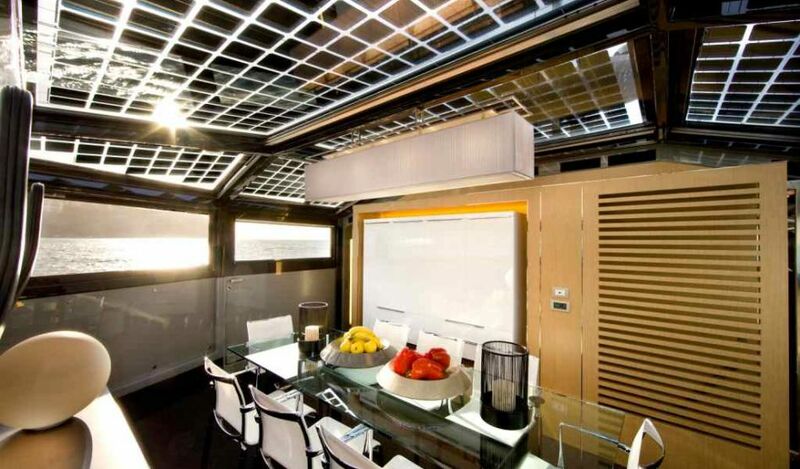 Motor yacht Solar reflects a perfect, harmonious blend between the indoor and outdoor areas. Her aft deck is quite large for the ship of her size, and features a well protected cockpit, perfect for dining, as well as large sunbathing area towards the stern of the yacht. Arcadia 85 motoryacht Solar does not offer a sundeck, however manages to include all the amenities normally found on the sundeck on the aft portion of the main deck. Motor yacht Solar is designed to be a family yacht, therefore combing different exterior functions in one single deck, gives guests more possibility to spend time together. 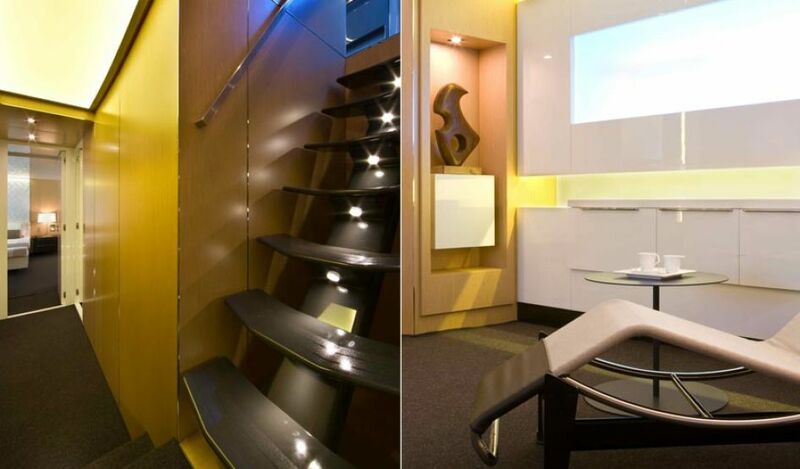 Four guest cabins can be found on the lower deck of the luxury Arcadia 85 Solar, including the spectacular owner's cabin aft. 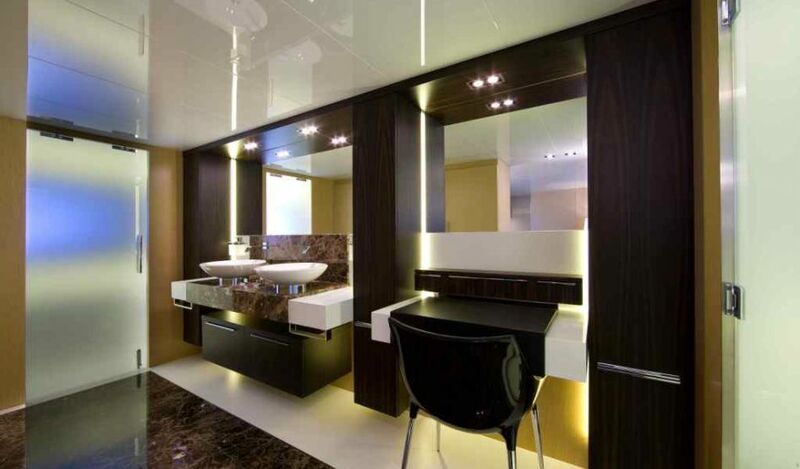 The room is unusually large with a stunningly beautiful en suite head. 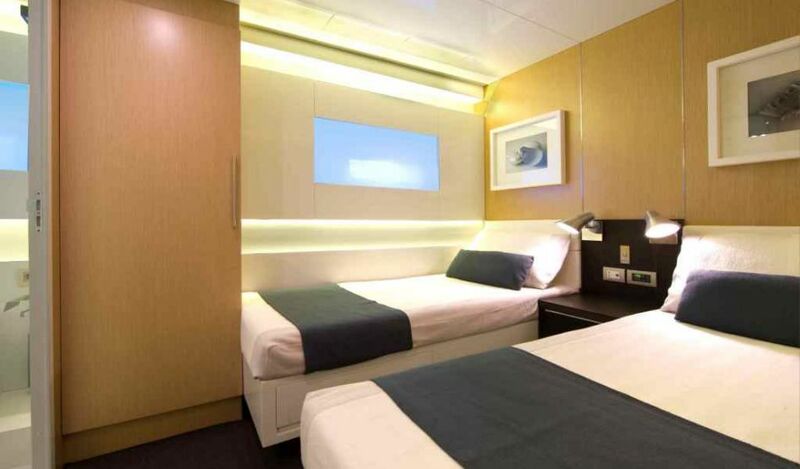 The large VIP cabin forward is fitted with double bed. And there are also two more twin cabins. 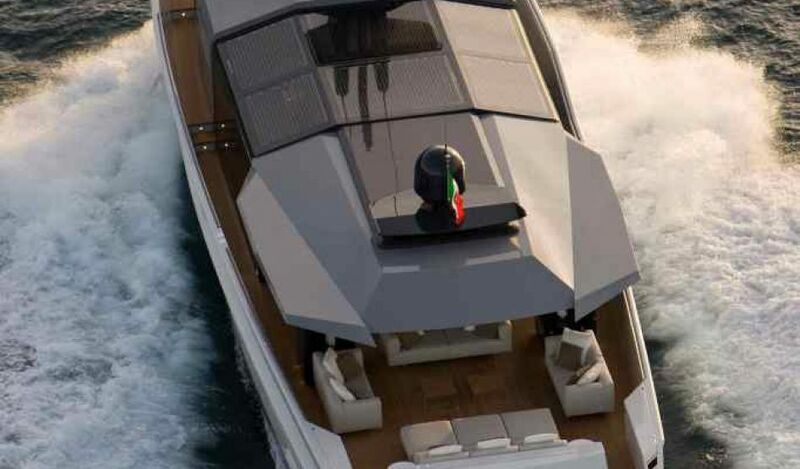 The bow of the yacht offers space for crew, which can be accessed through a hatch underneath the forward sun pads. 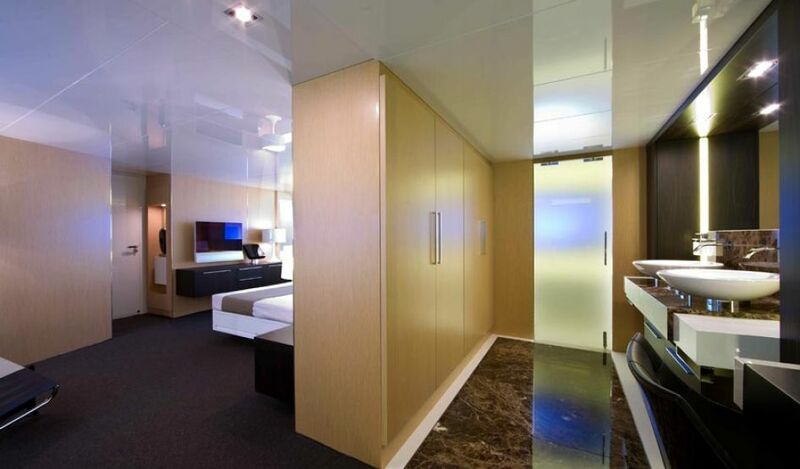 M/Y Solar's main saloon is more intimate and provides space for up to 8 guests. However, the aft deck being well protected against the elements, gives a larger possibility to guest to spend most of the time there, instead of inside. 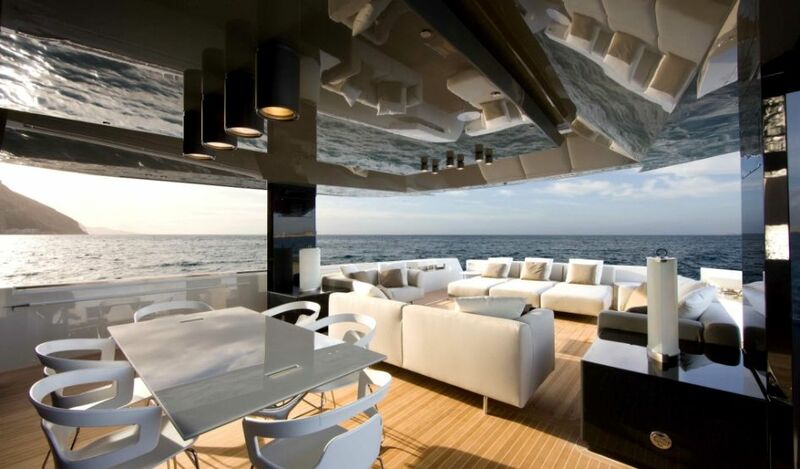 The interior of the yacht features modern furniture by well known Italian design houses, such as B&B Italia and Schiffini. Almost all the interior is composed of loose pieces of furniture, thus giving the option of creating different layouts. Forward the main saloon passed the galley there is a dining room , which opens to the wheelhouse. The dining room can be opened up with large sliding doors to the side deck. 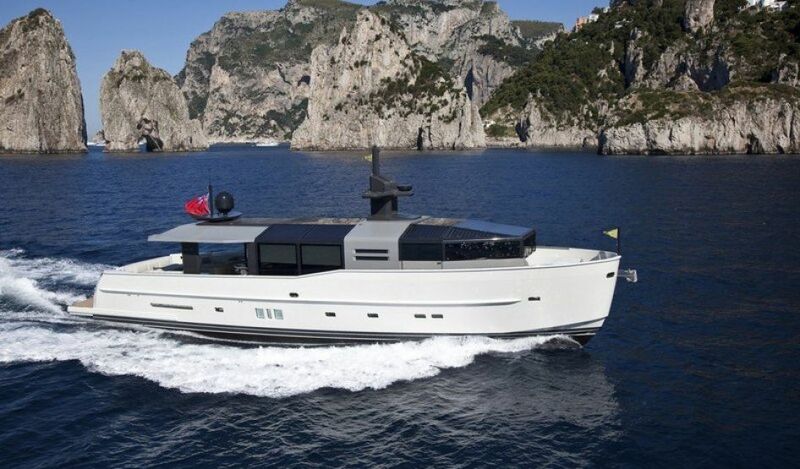 The 23.97 metre motor yacht Arcadia 85 has a displacement of 55 tons. She is powered by twin MAN diesels, giving her the maximum speed of 18 knots and she can comfortably cruise at the speed of 16 knots. Her range is 500nm.